Brodi Ashton was a part of the writing force that gave me My Lady Jane this year. And I do mean "me", because for just a moment while reading that beloved text, I truly believed it was written specifically for me. It had my favorite kind of humor, it broke the fourth wall, and it was chalked full of familiar history turned on its head in the most magical of ways. I had hoped that everything written by the three authors would be equally as magical. I fear I was wrong. Piper Baird is an ambitious teen set on getting a prestigious scholarship to study journalism in college. In order to be eligible for the award, she must attend Chiswick Academy, an exclusive school filled with the rich and "famous" in Washington D.C. 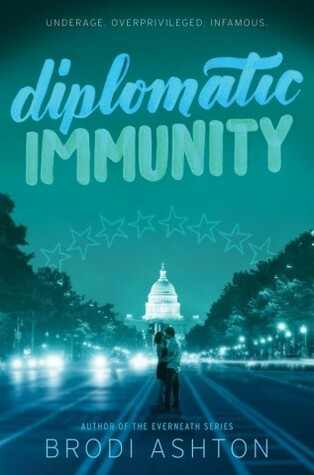 Looking for a way to get the attention of the scholarship panelists, Piper decides to write an expose on the students who have diplomatic immunity (the children of ambassadors and diplomats who get away with anything and everything just because of their wealth and the importance of their parents.) It is all going according to plan until Piper's new friendship with Rafael, the son of the Spanish ambassador, becomes something she doesn't want to lose. I've read this story before. I've watched this story before. I think we've all probably read or watched this story before. I knew from the first chapter exactly what was going to happen, and for the type of reader who is often oblivious, that is very telling. Poor communication skills, misunderstood rich kids, and everything turns out fine in the end. Very formulaic in delivery. Sometimes this can be overlooked if you like the characters. I didn't not like the characters, but I also didn't love them. I had ambivalent affection for them. The resolution also seemed very abrupt. Piper has managed to turn her whole world upside down, but the fallout is minimal and areas that could be explored, especially when it came to her home life, could have been given more attention. Not a bad book, but not a great one either. I preferred E. Lockhart's The Disreputable History of Frankie Landau Banks and Stephanie Perkins's Anna and the French Kiss. Still, I'll probably give Brodie Ashton another try. Because, well, My Lady Jane.